The Google Brain team works to advance the state of the art in artificial intelligence by research and systems engineering, as one part of the overall Google AI effort. In Part 1 of this blog post, we shared some of our work in 2017 related to our broader research, from designing new machine learning algorithms and techniques to understanding them, as well as sharing data, software, and hardware with the community. In this post, we’ll dive into the research we do in some specific domains such as healthcare, robotics, creativity, fairness and inclusion, as well as share a little more about us. We feel there is enormous potential for the application of machine learning techniques to healthcare. We are doing work across many different kinds of problems, including assisting pathologists in detecting cancer, understanding medical conversations to assist doctors and patients, and using machine learning to tackle a wide variety of problems in genomics, including an open-source release of a highly accurate variant calling system based on deep learning. 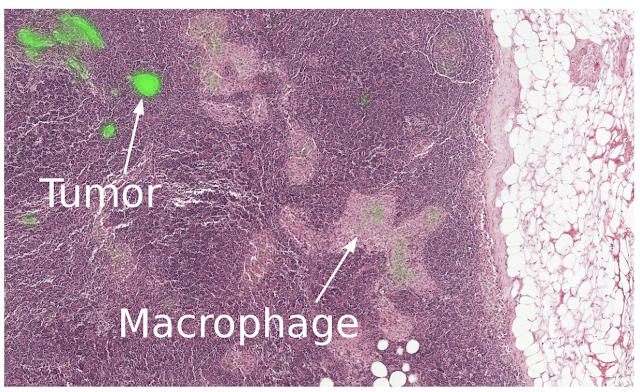 A lymph node biopsy, where our algorithm correctly identifies the tumor and not the benign macrophage. We have continued our work on early detection of diabetic retinopathy (DR) and macular edema, building on the research paper we published December 2016 in the Journal of the American Medical Association (JAMA). In 2017, we moved this project from research project to actual clinical impact. We partnered with Verily (a life sciences company within Alphabet) to guide this work through the regulatory process, and together we are incorporating this technology into Nikon's line of Optos ophthalmology cameras. In addition, we are working to deploy this system in India, where there is a shortage of 127,000 eye doctors and as a result, almost half of patients are diagnosed too late — after the disease has already caused vision loss. As a part of a pilot, we’ve launched this system to help graders at Aravind Eye Hospitals to better diagnose diabetic eye disease. We are also working with our partners to understand the human factors affecting diabetic eye care, from ethnographic studies of patients and healthcare providers, to investigations on how eye care clinicians interact with the AI-enabled system. 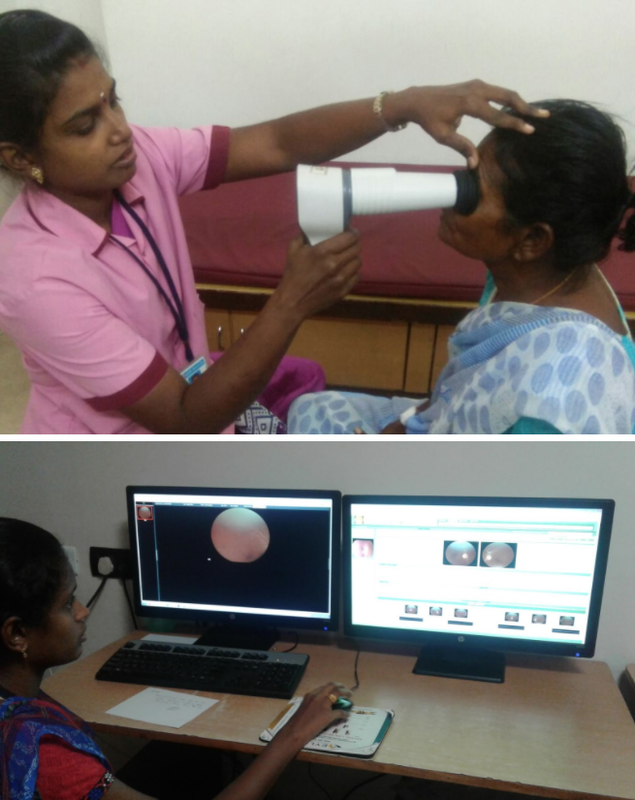 First patient screened (top) and Iniya Paramasivam, a trained grader, viewing the output of the system (bottom). We have also teamed up with researchers at leading healthcare organizations and medical centers including Stanford, UCSF, and University of Chicago to demonstrate the effectiveness of using machine learning to predict medical outcomes from de-identified medical records (i.e. given the current state of a patient, we believe we can predict the future for a patient by learning from millions of other patients’ journeys, as a way of helping healthcare professionals make better decisions). We’re very excited about this avenue of work and we look to forward to telling you more about it in 2018. Our long-term goal in robotics is to design learning algorithms to allow robots to operate in messy, real-world environments and to quickly acquire new skills and capabilities via learning, rather than the carefully-controlled conditions and the small set of hand-programmed tasks that characterize today’s robots. One thrust of our research is on developing techniques for physical robots to use their own experience and those of other robots to build new skills and capabilities, pooling the shared experiences in order to learn collectively. We are also exploring ways in which we can combine computer-based simulations of robotic tasks with physical robotic experience to learn new tasks more rapidly. While the physics of the simulator don’t entirely match up with the real world, we have observed that for robotics, simulated experience plus a small amount of real-world experience gives significantly better results than even large amounts of real-world experience on its own. In addition to real-world robotic experience and simulated robotic environments, we have developed robotic learning algorithms that can learn by observing human demonstrations of desired behaviors, and believe that this imitation learning approach is a highly promising way of imparting new abilities to robots very quickly, without explicit programming or even explicit specification of the goal of an activity. For example, below is a video of a robot learning to pour from a cup in just 15 minutes of real world experience by observing humans performing this task from different viewpoints and then trying to imitate the behavior. As we might be with our own three-year-old child, we’re encouraged that it only spills a little! We also co-organized and hosted the first occurrence of the new Conference on Robot Learning (CoRL) in November to bring together researchers working at the intersection of machine learning and robotics. The summary of the event contains more information, and we look forward to next year’s occurrence of the conference in Zürich. We are also excited about the long term potential of using machine learning to help solve important problems in science. Last year, we utilized neural networks for predicting molecular properties in quantum chemistry, finding new exoplanets in astronomical datasets, earthquake aftershock prediction, and used deep learning to guide automated proof systems. Finding a new exoplanet: observing brightness of stars when planets block their light. We’re very interested in how to leverage machine learning as a tool to assist people in creative endeavors. This year, we created an AI piano duet tool, helped YouTube musician Andrew Huang create new music (see also the behind the scenes video with Nat & Friends), and showed how to teach machines to draw. A garden drawn by the SketchRNN model; an interactive demo is available. We also demonstrated how to control deep generative models running in the browser to create new music. This work won the NIPS 2017 Best Demo Award, making this the second year in a row that members of the Brain team’s Magenta project have won this award, following on our receipt of the NIPS 2016 Best Demo Award for Interactive musical improvisation with Magenta. 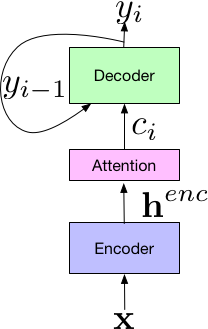 In the YouTube video below, you can listen to one part of the demo, the MusicVAE variational autoencoder model morphing smoothly from one melody to another. Advances in machine learning offer entirely new possibilities for how people might interact with computers. At the same time, it’s critical to make sure that society can broadly benefit from the technology we’re building. We see these opportunities and challenges as an urgent matter, and teamed up with a number of people throughout Google to create the People + AI Research (PAIR) initiative. PAIR’s goal is to study and design the most effective ways for people to interact with AI systems. We kicked off the initiative with a public symposium bringing together academics and practitioners across disciplines ranging from computer science, design, and even art. PAIR works on a wide range of topics, some of which we’ve already mentioned: helping researchers understand ML systems through work on interpretability and expanding the community of developers with deeplearn.js. Another example of our human-centered approach to ML engineering is the launch of Facets, a tool for visualizing and understanding training datasets. Facets provides insights into your training datasets. As ML plays an increasing role in technology, considerations of inclusivity and fairness grow in importance. The Brain team and PAIR have been working hard to make progress in these areas. We’ve published on how to avoid discrimination in ML systems via causal reasoning, the importance of geodiversity in open datasets, and posted an analysis of an open dataset to understand diversity and cultural differences. We’ve also been working closely with the Partnership on AI, a cross-industry initiative, to help make sure that fairness and inclusion are promoted as goals for all ML practitioners. Cultural differences can surface in training data even in objects as “universal” as chairs, as observed in these doodle patterns on the left. 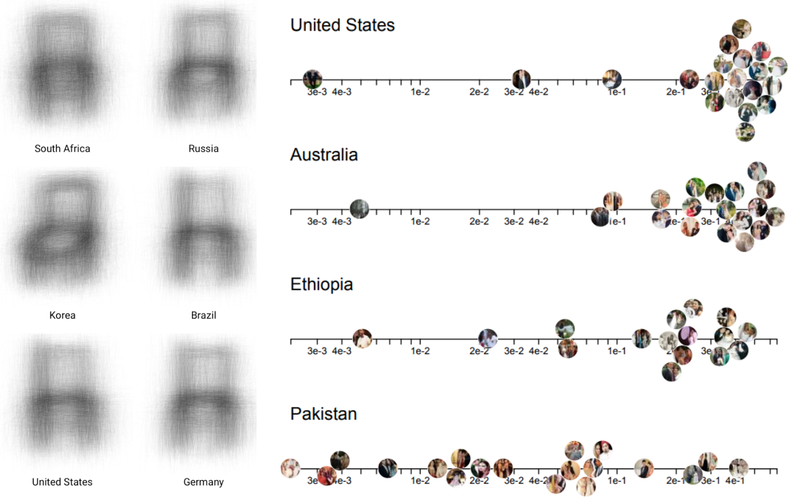 The chart on the right shows how we uncovered geo-location biases in standard open source data sets such as ImageNet. Undetected or uncorrected, such biases may strongly influence model behavior. We made this video in collaboration with our colleagues at Google Creative Lab as a non-technical introduction to some of the issues in this area. One aspect of our group’s research culture is to empower researchers and engineers to tackle the basic research problems that they view as most important. In September, we posted about our general approach to conducting research. Educating and mentoring young researchers is something we do through our research efforts. Our group hosted over 100 interns last year, and roughly 25% of our research publications in 2017 have intern co-authors. In 2016, we started the Google Brain Residency, a program for mentoring people who wanted to learn to do machine learning research. In the inaugural year (June 2016 to May 2017), 27 residents joined our group, and we posted updates about the first year of the program in halfway through and just after the end highlighting the research accomplishments of the residents. Many of the residents in the first year of the program have stayed on in our group as full-time researchers and research engineers, and most of those that did not have gone on to Ph.D. programs at top machine learning graduate programs like Berkeley, CMU, Stanford, NYU and Toronto. In July, 2017, we also welcomed our second cohort of 35 residents, who will be with us until July, 2018, and they’ve already done some exciting research and published at numerous research venues. We’ve now broadened the program to include many other research groups across Google and renamed it the Google AI Residency program (the application deadline for this year's program has just passed; look for information about next year's program at g.co/airesidency/apply). Our work in 2017 spanned more than we’ve highlighted on in this two-part blog post. We believe in publishing our work in top research venues, and last year our group published 140 papers, including more than 60 at ICLR, ICML, and NIPS. To learn more about our work, you can peruse our research papers. You can also meet some of our team members in this video, or read our responses to our second Ask Me Anything (AMA) post on r/MachineLearning (and check out the 2016’s AMA, too). The Google Brain team is becoming more spread out, with team members across North America and Europe. If the work we’re doing sounds interesting and you’d like to join us, you can see our open positions and apply for internships, the AI Residency program, visiting faculty, or full-time research or engineering roles using the links at the bottom of g.co/brain. You can also follow our work throughout 2018 here on the Google Research blog, or on Twitter at @GoogleResearch. You can also follow my personal account at @JeffDean. The Google Brain team works to advance the state of the art in artificial intelligence by research and systems engineering, as one part of the overall Google AI effort. Last year we shared a summary of our work in 2016. Since then, we’ve continued to make progress on our long-term research agenda of making machines intelligent, and have collaborated with a number of teams across Google and Alphabet to use the results of our research to improve people’s lives. This first of two posts will highlight some of our work in 2017, including some of our basic research work, as well as updates on open source software, datasets, and new hardware for machine learning. In the second post we’ll dive into the research we do in specific domains where machine learning can have a large impact, such as healthcare, robotics, and some areas of basic science, as well as cover our work on creativity, fairness and inclusion and tell you a bit more about who we are. A significant focus of our team is pursuing research that advances our understanding and improves our ability to solve new problems in the field of machine learning. Below are several themes from our research last year. The goal of automating machine learning is to develop techniques for computers to solve new machine learning problems automatically, without the need for human machine learning experts to intervene on every new problem. If we’re ever going to have truly intelligent systems, this is a fundamental capability that we will need. We developed new approaches for designing neural network architectures using both reinforcement learning and evolutionary algorithms, scaled this work to state-of-the-art results on ImageNet classification and detection, and also showed how to learn new optimization algorithms and effective activation functions automatically. We are actively working with our Cloud AI team to bring this technology into the hands of Google customers, as well as continuing to push the research in many directions. Another theme is on developing new techniques that improve the ability of our computing systems to understand and generate human speech, including our collaboration with the speech team at Google to develop a number of improvements for an end-to-end approach to speech recognition, which reduces the relative word error rate over Google’s production speech recognition system by 16%. One nice aspect of this work is that it required many separate threads of research to come together (which you can find on Arxiv: 1, 2, 3, 4, 5, 6, 7, 8, 9). 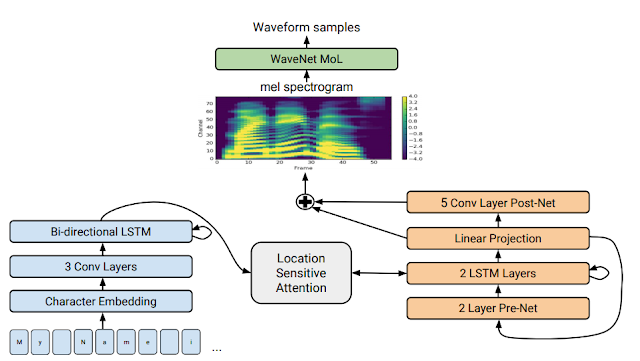 We also collaborated with our research colleagues on Google’s Machine Perception team to develop a new approach for performing text-to-speech generation (Tacotron 2) that dramatically improves the quality of the generated speech. This model achieves a mean opinion score (MOS) of 4.53 compared to a MOS of 4.58 for professionally recorded speech like you might find in an audiobook, and 4.34 for the previous best computer-generated speech system. You can listen for yourself. We continued to develop novel machine learning algorithms and approaches, including work on capsules (which explicitly look for agreement in activated features as a way of evaluating many different noisy hypotheses when performing visual tasks), sparsely-gated mixtures of experts (which enable very large models that are still computational efficient), hypernetworks (which use the weights of one model to generate weights for another model), new kinds of multi-modal models (which perform multi-task learning across audio, visual, and textual inputs in the same model), attention-based mechanisms (as an alternative to convolutional and recurrent models), symbolic and non-symbolic learned optimization methods, a technique to back-propagate through discrete variables, and a few new reinforcement learning algorithmic improvements. The use of machine learning to replace traditional heuristics in computer systems also greatly interests us. We have shown how to use reinforcement learning to make placement decisions for mapping computational graphs onto a set of computational devices that are better than human experts. With other colleagues in Google Research, we have shown in “The Case for Learned Index Structures” that neural networks can be both faster and much smaller than traditional data structures such as B-trees, hash tables, and Bloom filters. We believe that we are just scratching the surface in terms of the use of machine learning in core computer systems, as outlined in a NIPS workshop talk on Machine Learning for Systems and Systems for Machine Learning. Machine learning and its interactions with security and privacy continue to be major research foci for us. We showed that machine learning techniques can be applied in a way that provides differential privacy guarantees, in a paper that received one of the best paper awards at ICLR 2017. We also continued our investigation into the properties of adversarial examples, including demonstrating adversarial examples in the physical world, and how to harness adversarial examples at scale during the training process to make models more robust to adversarial examples. While we have seen impressive results with deep learning, it is important to understand why it works, and when it won’t. In another one of the best paper awards of ICLR 2017, we showed that current machine learning theoretical frameworks fail to explain the impressive results of deep learning approaches. We also showed that the “flatness” of minima found by optimization methods is not as closely linked to good generalization as initially thought. 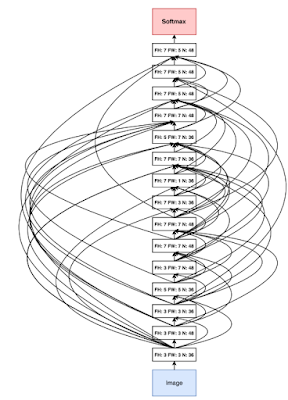 In order to better understand how training proceeds in deep architectures, we published a series of papers analyzing random matrices, as they are the starting point of most training approaches. Another important avenue to understand deep learning is to better measure their performance. We showed the importance of good experimental design and statistical rigor in a recent study comparing many GAN approaches that found many popular enhancements to generative models do not actually improve performance. We hope this study will give an example for other researchers to follow in making robust experimental studies. We are developing methods that allow better interpretability of machine learning systems. And in March, in collaboration with OpenAI, DeepMind, YC Research and others, we announced the launch of Distill, a new online open science journal dedicated to supporting human understanding of machine learning. It has gained a reputation for clear exposition of machine learning concepts and for excellent interactive visualization tools in its articles. In its first year, Distill has published many illuminating articles aimed at understanding the inner working of various machine learning techniques, and we look forward to the many more sure to come in 2018. 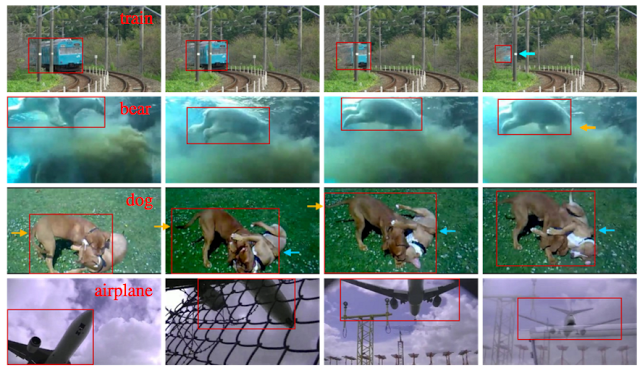 Examples from the YouTube-Bounding Boxes dataset: Video segments sampled at 1 frame per second, with bounding boxes successfully identified around the items of interest. 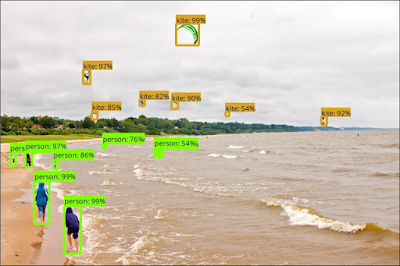 Throughout our team’s history, we have built tools that help us to conduct machine learning research and deploy machine learning systems in Google’s many products. In November 2015, we open-sourced our second-generation machine learning framework, TensorFlow, with the hope of allowing the machine learning community as a whole to benefit from our investment in machine learning software tools. In February, we released TensorFlow 1.0, and in November, we released v1.4 with these significant additions: Eager execution for interactive imperative-style programming, XLA, an optimizing compiler for TensorFlow programs, and TensorFlow Lite, a lightweight solution for mobile and embedded devices. The pre-compiled TensorFlow binaries have now been downloaded more than 10 million times in over 180 countries, and the source code on GitHub now has more than 1,200 contributors. In February, we hosted the first ever TensorFlow Developer Summit, with over 450 people attending live in Mountain View and more than 6,500 watching on live streams around the world, including at more than 85 local viewing events in 35 countries. All talks were recorded, with topics ranging from new features, techniques for using TensorFlow, or detailed looks under the hoods at low-level TensorFlow abstractions. We’ll be hosting another TensorFlow Developer Summit on March 30, 2018 in the Bay Area. Sign up now to save the date and stay updated on the latest news. This rock-paper-scissors science experiment is a novel use of TensorFlow. We’ve been excited by the wide variety of uses of TensorFlow we saw in 2017, including automating cucumber sorting, finding sea cows in aerial imagery, sorting diced potatoes to make safer baby food, identifying skin cancer, helping to interpret bird call recordings in a New Zealand bird sanctuary, and identifying diseased plants in the most popular root crop on Earth in Tanzania! In November, TensorFlow celebrated its second anniversary as an open-source project. It has been incredibly rewarding to see a vibrant community of TensorFlow developers and users emerge. TensorFlow is the #1 machine learning platform on GitHub and one of the top five repositories on GitHub overall, used by many companies and organizations, big and small, with more than 24,500 distinct repositories on GitHub related to TensorFlow. Many research papers are now published with open-source TensorFlow implementations to accompany the research results, enabling the community to more easily understand the exact methods used and to reproduce or extend the work. TensorFlow has also benefited from other Google Research teams open-sourcing related work, including TF-GAN, a lightweight library for generative adversarial models in TensorFlow, TensorFlow Lattice, a set of estimators for working with lattice models, as well as the TensorFlow Object Detection API. The TensorFlow model repository continues to grow with an ever-widening set of models. In addition to TensorFlow, we released deeplearn.js, an open-source hardware-accelerated implementation of deep learning APIs right in the browser (with no need to download or install anything). The deeplearn.js homepage has a number of great examples, including Teachable Machine, a computer vision model you train using your webcam, and Performance RNN, a real-time neural-network based piano composition and performance demonstration. We’ll be working in 2018 to make it possible to deploy TensorFlow models directly into the deeplearn.js environment. About five years ago, we recognized that deep learning would dramatically change the kinds of hardware we would need. Deep learning computations are very computationally intensive, but they have two special properties: they are largely composed of dense linear algebra operations (matrix multiples, vector operations, etc. ), and they are very tolerant of reduced precision. 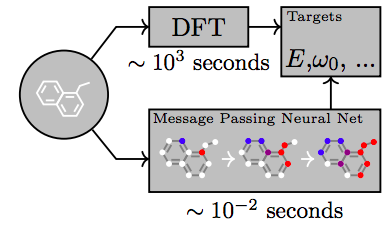 We realized that we could take advantage of these two properties to build specialized hardware that can run neural network computations very efficiently. We provided design input to Google’s Platforms team and they designed and produced our first generation Tensor Processing Unit (TPU): a single-chip ASIC designed to accelerate inference for deep learning models (inference is the use of an already-trained neural network, and is distinct from training). 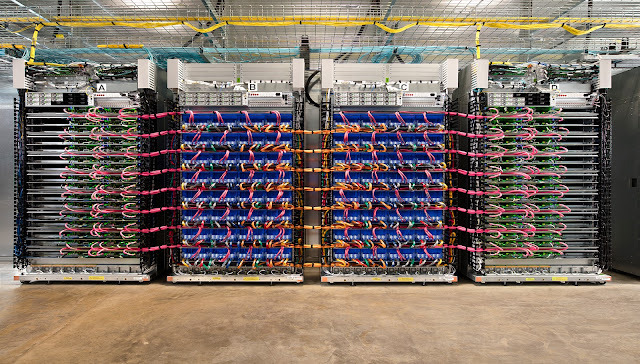 This first-generation TPU has been deployed in our data centers for three years, and it has been used to power deep learning models on every Google Search query, for Google Translate, for understanding images in Google Photos, for the AlphaGo matches against Lee Sedol and Ke Jie, and for many other research and product uses. In June, we published a paper at ISCA 2017, showing that this first-generation TPU was 15X - 30X faster than its contemporary GPU or CPU counterparts, with performance/Watt about 30X - 80X better. 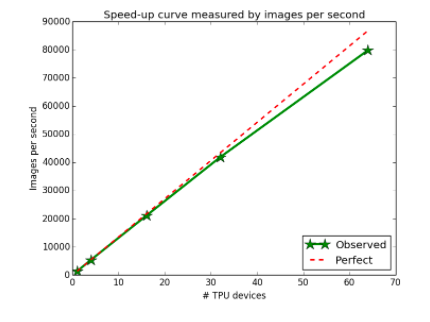 Experiments with ResNet-50 training on ImageNet show near-perfect speed-up as the number of TPU devices used increases. Inference is important, but accelerating the training process is an even more important problem - and also much harder. The faster researchers can try a new idea, the more breakthroughs we can make. Our second-generation TPU, announced at Google I/O in May, is a whole system (custom ASIC chips, board and interconnect) that is designed to accelerate both training and inference, and we showed a single device configuration as well as a multi-rack deep learning supercomputer configuration called a TPU Pod. We announced that these second generation devices will be offered on the Google Cloud Platform as Cloud TPUs. We also unveiled the TensorFlow Research Cloud (TFRC), a program to provide top ML researchers who are committed to sharing their work with the world with access to a cluster of 1,000 Cloud TPUs for free. In December, we presented work showing that we can train a ResNet-50 ImageNet model to a high level of accuracy in 22 minutes on a TPU Pod as compared to days or longer on a typical workstation. We think lowering research turnaround times in this fashion will dramatically increase the productivity of machine learning teams here at Google and at all of the organizations that use Cloud TPUs. If you’re interested in Cloud TPUs, TPU Pods, or the TensorFlow Research Cloud, you can sign up to learn more at g.co/tpusignup. We’re excited to enable many more engineers and researchers to use TPUs in 2018! Edit 17/01/2018: Due to popular request, the CLIC competition submission deadline has been extended to April 22. Please see compression.cc for more details. Image compression is critical to digital photography — without it, a 12 megapixel image would take 36 megabytes of storage, making most websites prohibitively large. While the signal-processing community has significantly improved image compression beyond JPEG (which was introduced in the 1980’s) with modern image codecs (e.g., BPG, WebP), many of the techniques used in these modern codecs still use the same family of pixel transforms as are used in JPEG. 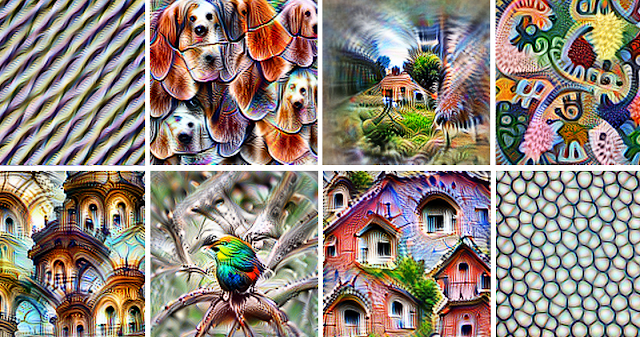 Multiple recent Google projects improve the field of image compression with end-to-end with machine learning, compression through superresolution and creating perceptually improved JPEG images, but we believe that even greater improvements to image compression can be obtained by bringing this research challenge to the attention of the larger machine learning community. To encourage progress in this field, Google, in collaboration with ETH and Twitter, is sponsoring the Workshop and Challenge on Learned Image Compression (CLIC) at the upcoming 2018 Computer Vision and Pattern Recognition conference (CVPR 2018). The workshop will bring together established contributors to traditional image compression with early contributors to the emerging field of learning-based image compression systems. Our invited speakers include image and video compression experts Jim Bankoski (Google) and Jens Ohm (RWTH Aachen University), as well as computer vision and machine learning experts with experience in video and image compression, Oren Rippel (WaveOne) and Ramin Zabih (Google, on leave from Cornell). A database of copyright-free, high-quality images will be made available both for this challenge and in an effort to accelerate research in this area: Dataset P (“professional”) and Dataset M (“mobile”). The datasets are collected to be representative for images commonly used in the wild, containing thousands of images. While the challenge will allow participants to train neural networks or other methods on any amount of data (but we expect participants to have access to additional data, such as ImageNet and the Open Images Dataset), it should be possible to train on the datasets provided. The first large-image compression systems using neural networks were published in 2016 [Toderici2016, Ballé2016] and were only just matching JPEG performance. More recent systems have made rapid advances, to the point that they match or exceed the performance of modern industry-standard image compression [Ballé2017, Theis2017, Agustsson2017, Santurkar2017, Rippel2017]. This rapid advance in the quality of neural-network-based compression systems, based on the work of a comparatively small number of research labs, leads us to expect even more impressive results when the area is explored by a larger portion of the machine-learning community. We hope to get your help advancing the state-of-the-art in this important application area, and we encourage you to participate if you are planning to attend CVPR this year! Please see compression.cc for more details about the new datasets and important workshop deadlines. Training data is already available on that site. The test set will be released on February 15 and the deadline for submitting the compressed versions of the test set is February 22. Edit 17/01/2018: Due to popular request, the CLIC competition submission deadline has been extended to April 22. Please see compression.cc for more details.